I was pleasantly surprised to receive a pair of Skoras from my sister and brother in law for my birthday. Before we praise them for their generosity, they quickly told me they bought them for me so I don’t have to wear “those ugly shoes with the toes”. Point taken. Vibram Five Fingers are a little ugly. I think we all agree that the new breed of minimalist shoe with a wide toe box surpasses the Five Finger in looks and comfort, while giving little if any ground away in functionality without the individual toe boxes. I didn’t really know much about the company. I haven’t been in the market for a new pair of shoes in quite a while. I have two pair of Merrells that fill me work and casual needs, and I have gravitated to New Balance for my running needs. My first impressions were the asymmetric lacing, quality shiny leather upper, bright colors, and slick sole obviously biased to the road. I felt as though it may be a little on the larger side for the size. If you are ordering online, I would recommend ordering down a half size. It also looked as though the heel was raised, which to any minimalist stalwart is a concern. Upon slipping the shoe on, it felt like a zero drop shoe. Reading the company website supports my suspicion of zero drop. I think the visual illusion of a raised heel is caused by the shaped heel of the shoe. I think the shaped heel is a defining part of the shoe and separates it from the square heels of other popular minimalist offerings. Slipping on the Cores and Taking a walk in the sleepy New England town my sister lives near was a pleasant experience. My toes have plenty of room, and there were no hot spots. Compared to the NB MT line and Merrell True line, the shoe seems to have more padding both in the sole and the insole. However, the shoe still disappeared on my foot as any minimalist shoe should. Walking through wet grass, the upper seemed fairly water repellent and dried quickly, as the company website claimed (goat leather). I have not yet run in the shoe, and it is likely I may keep this shoe in reserve for Casual Friday work days while relying on my beater NBs for running. Most of my running this year has been off pavement, and it would be a shame to dirty these zero drop lookers. Whether or not it is a good running shoe likely depends on your outlook on barefoot style running–do you see no harm in a little padding, or do you feel anything that inhibits complete foot feel of the surface is evil? 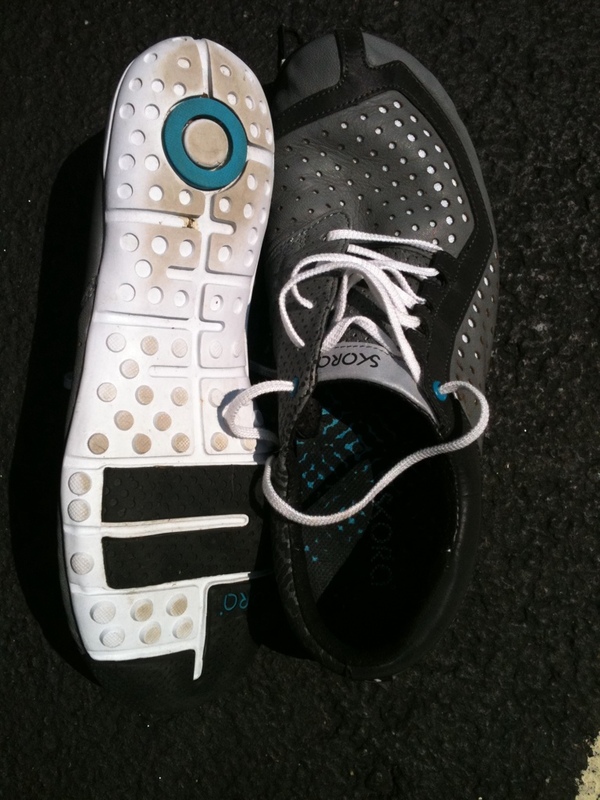 One thing is certain, my old ugly Vibram Five Fingers can’t compete with Skora in style, and the function of the Skora Core is more than satisfying for those of us who can’t understand why a shoe company thought it would be a good idea to mess with natural movement mechanics.